The Brattleboro Music Center presents a double bill with the roots-based music group Night Tree and the contemporary acoustic ensemble Dunham Shoe Factory. 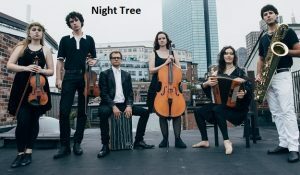 Night Tree is made up of six diverse musicians who came together unexpectedly within the walls of Boston’s New England Conservatory. The sextet attracts dramatic attention not only for its abnormal instrumentation of two fiddles, cello, accordion, saxophone, percussion, voice, and the occasional viola and mandolin, but for its collective representation and incorporation of traditions from Irish, Classical, Swedish, Jazz, Klezmer, and Afro-Cuban music. The group, all students at NEC, were named the Conservatory’s Wildcard Honors Ensemble for 2016-2017. Awards for this title included a sponsorship from NEC, a headlining performance at the historic Jordan Hall, and a year of working with Winifred Horan, fiddler and co-founder of Irish super-band, SOLAS. Night Tree will be releasing their debut album Sept. 1, produced by Séamus Egan, another founding member of SOLAS. The band began touring in Vermont at the beginning of 2017. 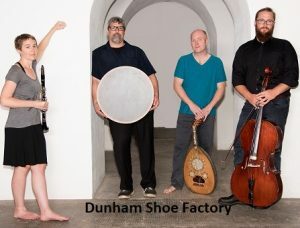 Dunham Shoe Factory is a collaboration between Anna Patton, Mac Ritchey, Todd Roach and Dave Haughey playing original compositions and influenced by world traditions. Combining the clarinet, oud, percussion and cello, their music draws from an array of styles including Egyptian, Jazz, Brazilian, Turkish, Classical and Indian music.